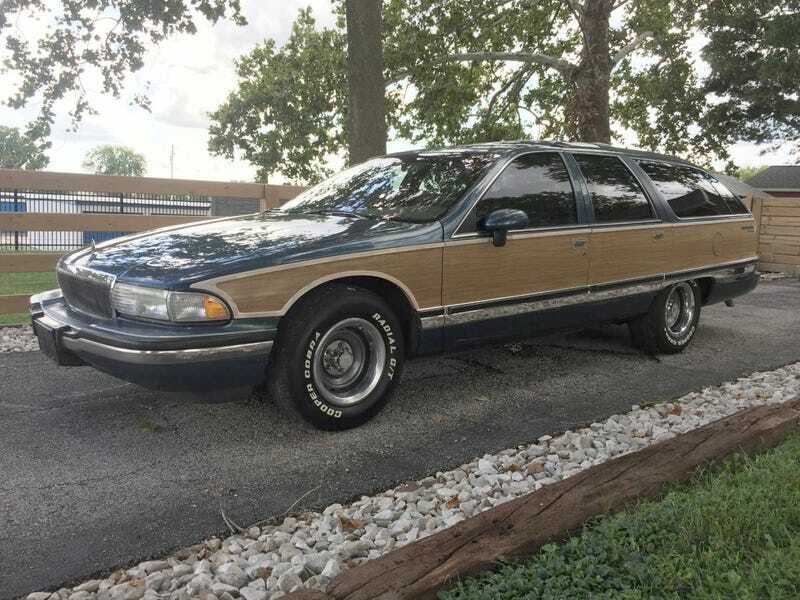 At $6,000, Would You Master the Road in This 1994 Buick Roadmaster? These days, go big or go home is a popular mantra by which to live. You could easily do both in today’s Nice Price or Crack Pipe Buick. That is, if the price is right. So, the general consensus regarding yesterday’s grey market imported 1991 Fiat Panda 750 was that cheap cars really need to be, well you know, cheap. At $7,500, that Panda seemingly wasn’t and it fell in a 75 percent Crack Pipe loss. The thing that could have made that Panda worth the money? Apparently 4-wheel drive. It seems that even in Europe the Panda 4X4 with its jacked-up body also comes with jacked up prices. Our Panda lacked that crucial feature, but was cute enough that, even if it failed in the vote, still didn’t fail to engender a smile. Being cute usually demands being small. Babies are cute, as are kittens, puppies and Pikachu. Owing to its size, today’s 1994 Buick Roadmaster wagon definitely does not meet the definition of being cute. Imposing and spatially extravagant are mote apt descriptors. Buick debuted the Roadmaster nameplate in the 1930s. It arrived along with a spate of other model names that supplanted the company’s former numeric model designations. The Roadmaster would slot between the Century and the company’s range topper, the Limited. Buick would juggle model designations over the course of the next 25 years, eventually putting the Roadmaster name on ice at the end of the 1959 model year. It would be resurrected again in 1991 for a series of B-body cars that effectively put the Electra brand in the Friendzone. The new Roadmaster models included a stately three-box sedan that would prove far more blue hair in style than its Chevy Caprice platform mate. That was despite the sharing of components like the headlights, mirrors and turn signals. Also offered at the time was a similarly grandiose three-row estate with Vista Roof topper. That’s the cool one. This cool one piles on the goodness by featuring acres of woodgrain side appliqués. Its cred is increased by a set of sweet Rally wheels wrapped in appreciably old-school white lettered tires. Up above, the bodywork is in laudable condition, but still exhibits a couple of scars that are noted in the ad’s pics. The seller describes the car as rust free, but strangely does show a pic of what appears to be the spare tire well which is perforated through on the bottom. That’s likely not that big a deal and the rest of the undercarriage looks to be solid. While you’re down there you might also note the Magnaflow mufflers and air assist bags inside the rear coils. The seller says the shocks are Bilstein at each corner and that all the brake hardware has been replaced in the past three years. Under the long hood lies an LT1 V8 with an aftermarket intake and air filter. These mills were good for 260 horsepower back in the day. There’s also not a lot to go wrong with them other than maybe the fuel injection. A 4-speed 4L60 automatic backs the engine up, as they do. The interior is in terrific shape with clean and intact leather and some luxurious looking carpeting all over the place. The only major element here showing wear is the steering wheel, but even that’s not all that bad. A double DIN head unit has been added to the mesa-like dash. Amazingly it doesn’t look totally out of place amidst all the ‘90s design. Back behind the rear seat is a kicker box and honestly, if I were buying this Buick the first thing I’d do in celebrating its purchase would be to drop that at the nearest e-Waste site. The rear-facing third seat is far more interesting back there anyway. The car comes with a modest 125,000 on the clock and a litany of maintenance work noted in its ad. It has a clean title and a $6,000 price tag. Now, just on the basis of cost per pound, or cost per inch, that price is going to be a deal. We don’t work that way so you now need to determine if that is in fact a deal for the whole car. What do you say, is $6,000 a bargain for this Buick? Or, will that price sadly keep you from mastering the road? Western IL Craigslist, or go here if the ad disappears. H/T to Gwillian for the hookup! A 1964 Buick Riviera for $8,000?